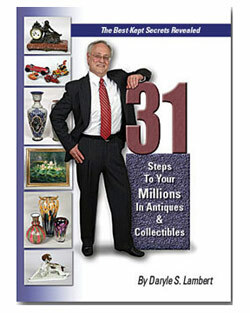 A 200 page book packed with industry secrets and tips for making money in the antique and collectible business. Guidance and advice plus personal mentoring from Mr. Lambert regarding items you own or are considering buying or selling. Eligibility to partner with the Club through the Associates program. You find it. We buy it. We share the profits with you. Eligibility to make money by becoming an Affiliate. NEW - Sell your collectibles on our website through our Classifieds.